Job creation is an important measure of economic success for businesses and for workers. New jobs offer workers the opportunity to gain employment, and a high job creation rate indicates that businesses are optimistic about about future growth. Louisville currently ranks 4th among its peer cities in job creation rate with a rate of 14%. Job creation rate represents the percentage of jobs that have been created within the past twelve months. Louisville is in the middle of its peer group according to a natural breaks algorithm. Cities in green are those that outperform their peers, cities in yellow represent the middle cluster, and those in red lag behind its peers on this indicator. 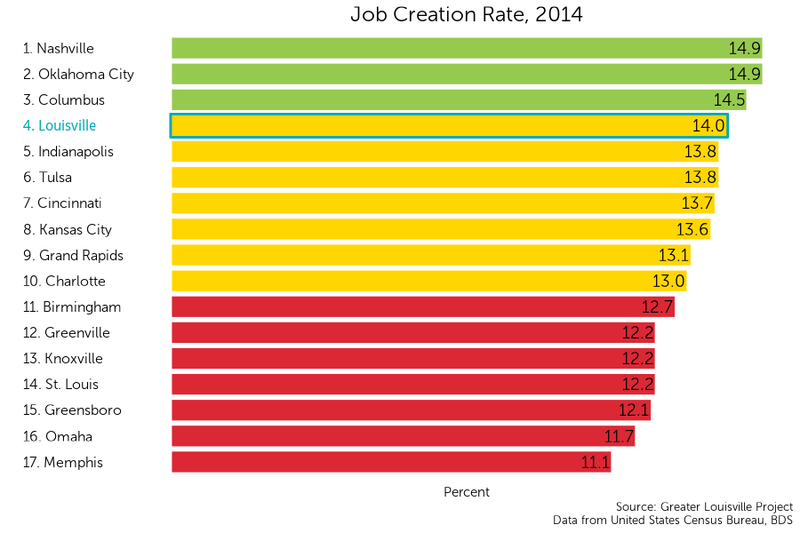 The job creation rate in Louisville has been steadily increasing since 2010. Before and during the recession, Louisville’s job creation rate declined and it consistently underperformed relative to its peer cities. Since 2010, however, Louisville’s growth has pushed it above the peer city mean.